Dave Smith MOM with finishes that would not be out of place in Premier League. Corinthians was on back foot whenever he had the ball. Had Corinthians finishing been on same level they would have won game. Rattling the post is not same as the ball in the back of net. Just one foul in forty minute match. What a game. Early stages I could only see Payzone winning, their use of Flyer keeper was causing Franklin major problems. After a rocky start and twice being a goal behind Franklin showed real class in getting a goal in front and strangling the game. 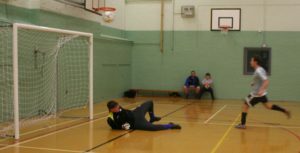 Both keepers were exceptional whilst the outfield play was at a level you would not expect to see in a small YMCA sports hall. 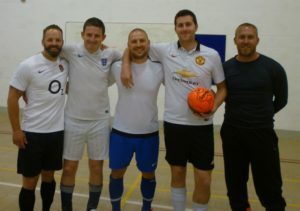 Scintillating performance from Me2 with their well drilled and practised fast pace cross pitch passing attack! 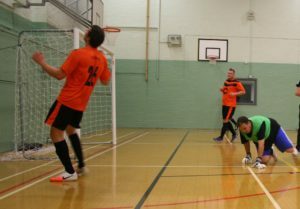 AJ’s were resilient and kept trying but need to learn possession and defensive line-up are key elements to good Futsal especially against a predatory Me2 team. AJ’s lead 2-1 after five minutes, Me2 barrage of goals came close to the end. 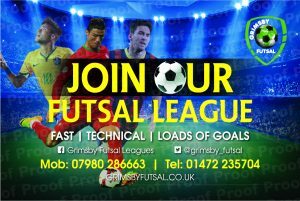 This entry was posted in Grimsby Futsal League on February 14, 2019 by Kevin Bryant.